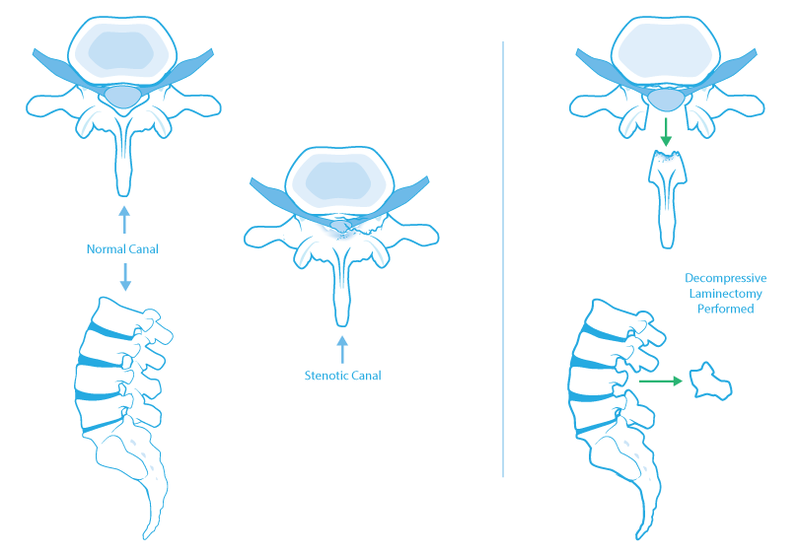 Spinal stenosis involves a narrowing of the spinal canal and lateral recesses through which the nerve roots and blood vessels pass. This narrowing is produced by a combination of thickening of the ligamentum flavum and facet joint hypertrophy. Patients with spinal stenosis are able to walk only short distances in a stooped position before experiencing leg pain. This pain (neurogenic claudication) typically travels down one or both legs below the knees. Usually the pain travels in a band like fashion down the side or back (or both) of the leg(s). Stooping or sitting allows relief by providing flexion of the lumbar spine, while standing upright increases the lordotic curve and increases symptoms. Detailed diagnostic work up is required to differentiate these symptoms from lower extremity vascular claudication, or spinal tumor which can present in a similar manner. CT and often MRI or myelography are used to demonstrate the impingement upon the cauda equina and nerve roots. Spinal stenosis is a progressive process and may require surgical intervention if symptoms are disabling. Best results are obtained when surgical intervention is performed prior to the development of permanent neurological deficit. In performing a decompressive lumbar laminectomy, the neurosurgeon removes the lamina, ligamentum flavum, and facet joints to eliminate the pressure which they exert on the nerve roots. The nerve roots are then "unroofed" at the lateral recess to provide room for free movement. A major study performed by this practice and published in "Journal of Neurosurgery" found that at short term follow-up (8.4 months), 93% of patients have relief of pain and 95% return to full activity. Despite the fact that elderly patients have many other disabling diseases, such as arthritis, to slow them down, at long term follow up (4.7 years), two thirds still had relief of pain, and half were able to perform normal activities. Age did not influence the good outcomes. Therefore, surgery may be considered in all patients with symptoms of spinal stenosis confirmed by diagnostic testing if those symptoms are significantly disabling. Moreover, The contents are masterwork. you have performed a great activity in this topic! Он даст необходимую помощь, чтобы ты смог устоять. Soy emprendedor, padre y mentor. Rapidez. Muchas gracias.